The house at the end of Abed Rabbo Street has become a deadly place to be. It sits on the east side of the Jabaliya refugee camp - the side that the Israeli army punched into just over a week ago. The wrecked neighbourhood echoes to the sound of machine gun fire. A 16-year-old girl called Islam Dawidar was baking bread with her mother in a room in the Abed Rabbo Street house when one of those bursts of fire came in through the window. "I heard shouting and I came in, and she was lying on the floor covered in blood," said her father, Maher Dawidar. "We called an ambulance, and it came in 15 minutes, but she was already dead." 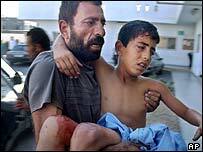 More than 70 Palestinians have died since the Israelis launched operation Days of Penitence. The Israeli human rights organisation, B'tselem, says more than 30 of them were civilians - like Islam Dawidar. The Israeli army has dropped leaflets on Jabaliya telling the people of the camp that groups like Hamas are making their already grim, often poverty-stricken lives worse. 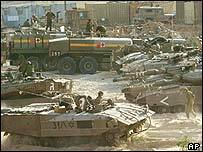 They would not have the Israeli army on their doorstep, if it was not for the violent campaigns waged by the militants. Nobody has paid a higher price than Mr Dawidar. But he has not turned against Hamas. "The Israelis are the attackers and occupiers. They are attacking us with tanks and planes. What should we do? Should we just sit here? What Hamas is doing is right." Further up the east side of the camp there is evidence of the destruction that the Israelis have brought to Jabaliya. The Tel Zataar kindergarten is in ruins. A bulldozer has wrecked the school that was built just five years ago for 500 children. In the all the wreckage, a picture has survived of a boy and a girl in a field of flowers. Over their heads is written the words "Our Palestine". But the full extent of the damage done to Jabaliya will only become clear once the army pulls out. Not far away in the alleyways, you find the reason why the Israelis have come to the camp. Militants move through the alleyways. They go wearing masks and carrying machine guns and grenades, and they look for ways to strike at the Israelis. But the army is watching for them too. All the time the small, unmanned Israeli spy planes circle slowly over Jabaliya. When the militants show themselves, they are struck with devastating force. The masked men from Hamas and Islamic Jihad are Israel's most implacable enemies. They want an end not only to the occupation of Gaza and the West Bank, which has lasted nearly 40 years. They believe that Israel itself sits on Palestinian land, and they say that they are ready to fight for generations to try to drive the Israelis into the sea. But the army has come here now to counter a much more immediate threat. Hamas has been bombarding areas just beyond Gaza with increasingly powerful rockets. Last week one hit the town of Sderot. It blew the legs off a little boy, killing him and another child he was playing with. Israel says no state could sit back and allow its most bitter enemies to rocket its homes and schools. I put Israel's argument to one of the militants in the alleyways. "Let them come," he said. "We will receive them." He carried two rocket-propelled grenades on his back.